A membership card or loyalty card is designed to give recognition to customer. Information collected from the loyalty programme provides great value for marketing campaign. 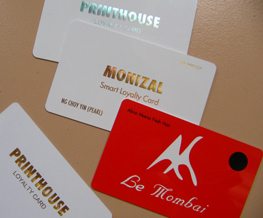 PRINTHOUSE produce and supply membership card with bardcode, magnetic stripe, Mifare or RFID technologies. Our plastic cards are solid PVC, extactly like the credit cards, with ISO Standard 0.76mm, professional finishings and it feels great. PRINTHOUSE also supplies scratch card and custom size speciality card too.